The Hawke’s Bay Electric-Power Board has a licensed area of approximately 1,700 square miles, the boundary of which follows (with one or two exceptions) that of the Hawke’s Bay County. Included in this area are the cities of Napier and Hastings, the boroughs of Taradale and Havelock North and several smaller settlements. 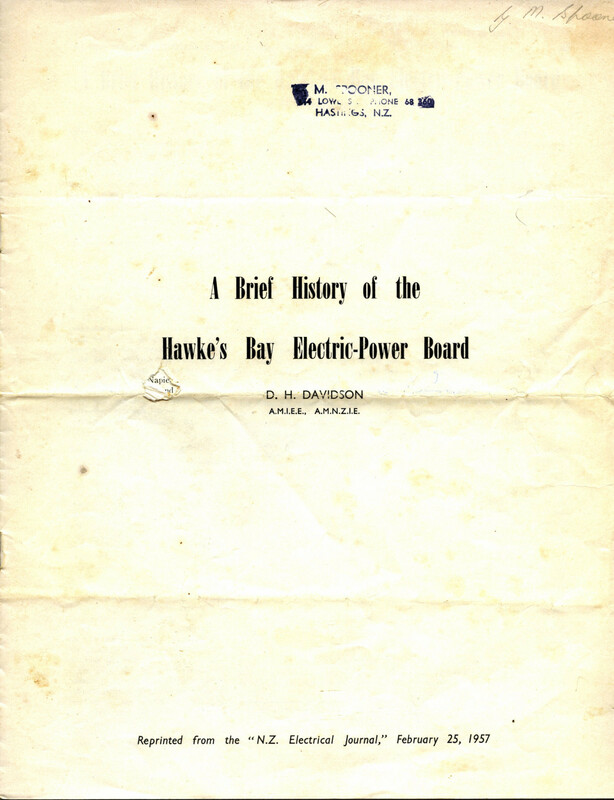 Very little is known of the early development of electric power supply in Hawke’s Bay. There is, however, operating today a small hydro plant of 15 kW. output which was installed in 1892 by John Chambers near his homestead at Motupeka Station. An 110 V. D.C. generator is driven by a reaction turbine made by Boving & Co. No doubt there were many other plants in use at this early period of which nothing is now known. Public supply was first commenced in both the Napier and Hastings Boroughs during 1912 and 1913. Napier City still remains a separate supply authority, although almost completely surrounded by the Hawke’s Bay E.P.B. On March 13, 1923, a provisional committee, sponsored by the Hawke’s Bay County, was set up to investigate and form a Power Board for the purchase and distribution of electricity throughout the county area. Both Napier and Hastings, who had for ten years been generating power for their own needs, indicated their readiness to purchase bulk power. The Havelock North Town Board was generating sufficient power for their own needs. Taradale agreed to merge its interests with those of the Board. Furthermore, the two freezing works were both agreeable to buying their power from the Board. Thus a substantial load seemed assured, and the culmination was the constitution of the Hawke’s Bay Electric-Power Board on June 19, 1924. The newly formed Board decided immediately to engage consulting engineers for the purpose of preparing plans for reticulation and estimates of cost. Vickerman and Lancaster, a firm of consultants, with already much experience in early reticulation problems, prepared such a scheme, and a report was before the Board in December of the same year. North Island N.Z. Hawkes Bay Electric Power Board District. It was recommended that there be a proposal to raise a loan of £300,000 for the reticulation of the district. Of this amount £275,000 was for the construction of works, the £25,000 to be used for financing consumers. This construction cost was to cover main feeder switchgear, the building of four 1,000 kVA. main feeder circuits at 11 kV., and main substations fo the stepping down from 11 kV. to 3 kV. To supply Hastings and Napier, as they were already reticulated at 3 kV. It was also intended that expenditure would include distribution lines, transformers, and all the necessary materials. A careful study was made of the load prospects in different areas and a scheme set out whereby those areas which would give the best return would be reticulated first. The estimated load potential, as appraised by the consultants, was a maximum demand of 2,000 kW. They also recommended that the Board guarantee to take not less than 2,500 kVA. in the fifth year of operation. This report was approved. A loan poll to raise £300,000 was taken in November, 1925, and the proposal was supported. It was in August, 1925, that the present general manager of the board, H. H. Wylie, was first appointed as secretary. D.H. Davidson, A.M.I.E.E., A.M.N.Z.I.E., was appointed assistant engineer to the Hawke’s Bay E.P.B. in 1945 following five years’ service in the R.N.Z.A.F. Tenders were called for the supply of materials. Work actually commenced in July, 1926, on line construction, and nine months later, in April, 1927, supply was taken from the Public Works Department’s substation at Redcliffe. Supply was available to Napier Borough on July 1, 1927, and later in the same year, the Hastings Borough was also being supplied. At this period Vickerman and Lancaster, having fulfilled their contract, asked to be released, and H. L. Benjamin, who had been resident engineer for the consultants, and was appointed as the Board’s engineer. Materials used during this initial construction period were selected wisely and have given excellent service. Main feeders were run on fabricated steel towers, while lesser lines were run on Bates steel poles. Although they have now been in service for thirty years, these structures show practically no signs of deterioration whatever. The conductors run on most of these tower lines were A.C.S.R. 6/.186 aluminium and 7/.0.62 steel. Very little trouble has been experienced with this conductor in spite of the proximity to the coast of the main feeders as they approach Napier. When first in service a number of outages occurred owing to birds sitting on the steel crossarms and contacting the conductors. This trouble was overcome by using large insulator pins and spacing blocks. Apart from these original main feeders, the Board’s policy has been to build lines constructed of Australian hardwood poles. They have proved satisfactory in that their expectancy of useful life has been exceeded. Many have been replaced, not because of decay, but because of the necessity of building up lines to carry heavier circuits. The conversion of single-circuit tower lines to double-circuit has made it necessary to erect intermediate hardwood poles between steel towers in order to shorten existing spans. Up to the present this continued use of hardwood poles has been an economically sound policy. The Havelock Town Board had, up till then, been able to supply its own power demands from different sources. The Town Board’s first supply of electric power was taken from the Hastings Borough Council in May, 1915. Negotiations between delegates of the newly formed Town Board and the Borough Council first began towards the end of 1912. An agreement was reached, and H. W. Climie, civil engineer, of Hastings, was engaged to submit a report on the supply of power to the town board area. The estimate was £3,500, or approximately £210 per mile of reticulation. This report was adopted, a poll taken and the scheme proceeded. With the increased demand, Havelock North decided to build an unattended 150 kW. hydro-electric plant in the Maraetotara stream, about ten miles from Hastings. This plant went into service in 1922. However, by 1929 their supply had again reached the stage where it required supplementing. As a result, on March 18, 1930, a bulk supply agreement was reached with the Power Board. No difficulty was experienced in making this additional supply available as the Board now had lines on three sides of the Town Board area. With the rapid growth of maximum demand it was now being realized that some positive means of peak-load control on hot water systems was necessary. Time switches and change-over switches were being used indiscriminately for the connection of services. It was obvious that a very considerable saving could be made during peak loading periods by installing time switches in all cases. This policy was adopted and an early start made. On February 3, 1931, the district was struck by a most disastrous earthquake. The loss of life and material damage resulting from the Napier earthquake are well known. The business area of Napier was razed to the ground, followed by fire, and Hastings suffered much the same fate. Losses sustained by the Power Board included stores and plant to the value of £11,000, which were burnt. Revenue for the year was reduced by a further £11,000. Cost of repairs amounted to approximately £3,700, so that the total financial loss was almost £26,000. This loss was a very serious setback, as the annual revenue at that time was £55,000. Perhaps the greatest damage suffered by the Board from the point of view of supply was the damage to bulk supply substations. Of a total of 19 transformers 14 capsized, badly damaging the cases and bushes, as well as the structures in which they were mounted. As transformers were repaired, methods of securely fixing them to their foundations were effected. Only one tower and two poles out of 524 on the bulk supply lines were damaged, thus proving the resistance of this type of construction to earthquake shocks. The same cannot be said of the wooden poles, as practically every pole in the affected area required straightening and re-ramming, or, if either a termination or an angle, reblocking was necessary and the lines had to be re-strained. In one case a transformer pole sank four feet owing to the loosening of the earth. Several platform type substations and single-pole substations were severely damaged, most of the transformers being thrown to the ground. The Government substation suffered similarly in that the supply transformers were thrown from their foundations. However, as the main transmission lines from the south still remain intact, an 11 kV. supply was given temporarily from Onga substation. This supply was made available 31 hours after the first shock. The Hastings Borough plant had not been seriously damaged, and thus they were able to maintain their own supply. Offers of assistance were received from practically every Board throughout the North Island and were greatly appreciated. Another shock on May 5, 1932, caused relatively minor troubles. The disturbance occurred at 7.55 p.m., and all protective devices installed at the Government substation for transformer protection operated as intended, cutting off supply. Material damage amounted to forty service lines needing repairs and the loss of approximately 50 gal. of oil from transformers and oil switches. On August 6, 1934, a committee consisting of representatives of both the Power Board and the Hastings Borough Council resolved that it be recommended to the Board and the Borough Council that they approve of an agreement for the purchase of the electrical undertaking of the Hastings B.C. by the Board. Electrical supply in the Hastings Borough began in 1912, when generating plant was first installed. This consisted of two diesels each directly coupled to 100 kW. D.C. generators. Two more diesels, each directly coupled to 150 kW. and 215 kW. D.C. generators, were installed in 1914 and 1917 respectively. A further two machines were installed — one of the 200 kW. And the last one of 320 kW., which was completed in 1925. Both these were alternators, the 320 kW. machine being the only survivor today, as the remainder have been broken up and sold as scrap. Possession was taken on October 1, 1934, the purchase price being £128,500. Although supply within the Borough had originally been D.C., there had been a gradual change-over to A.C. The Board had agreed, however, as a condition of purchase, that consumers would in no way be compelled to make the change-over, and that D.C. would still be made available. The honouring of this agreement is well proven, as it was almost twenty years later that the Board “lost” its last D.C. consumer. As new distribution lines and substations were being constructed in the Borough it became inevitable that the change to A.C. was most desirable, and consequently large numbers of consumers were being changed every day. With the depression years gradually receding it was expected that there would be extensive expansion, and thus the Board was preparing for a considerable increase in loading, especially in connection with hot water services. In view of this some more positive means of control over peak periods was deemed necessary, and so began the pilot control system of hot water installations. This method of control has been continued until the Board now has approximately 90 per cent. of the water-heating load so controlled. The remaining 10 per cent. is all rural and is controlled by time switch. Early in 1935 the Board launched a campaign to promote sales of electric ranges. Installation of ranges could be arranged on easy terms and at reduced rates. Cooking demonstrations were given and proved a great success—sales were phenomenal to the extent of depleting stocks in New Zealand of one particular make. 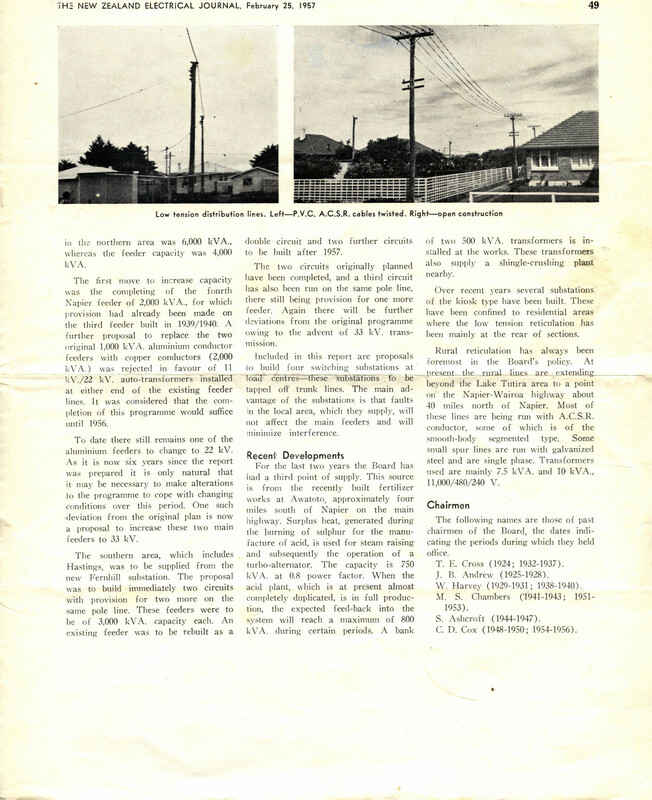 Havelock North was reticulated primarily for a lighting load, for which it had proved satisfactory. However, as the cooking load developed the lines were becoming hopelessly inadequate. This resulted, as already mentioned, in part of the Town district being given supply from the Board. It was obvious that much was to be gained by selling the undertaking to the Power Board. By March 31, 1937, negotiations had been completed and the plant was taken over, the purchase price being £9,910. Sufficient reason alone for the disposal of the undertaking was a reduction in tariff of 33⅓ per cent., apart from no deposit and easy terms on ranges and various other advantages. For almost fourteen years the Power Board had its headquarters in Napier. Up to 1936 this proved quite satisfactory, but with the purchase of the Hasting Borough, the major operations of the Board became centred around Hastings. Of the total 7,000 consumers at that time, 5,500 were either living in or nearer to Hastings than they were to Napier. At the same time office accommodation in Napier had become inadequate. Travelling time by outside staff to the southern part of the are was also becoming a major factor. Taking all these matters into consideration the Board decided to adopt recommendations that the headquarters be transferred to Hastings. A suitable site in the Main Street was purchased, a contract let for the erection of buildings for an office and store. On January 25, 1938, members of local bodies in Napier and Hastings assembled for the official opening of the Board’s new office block. It is interesting to note the changes in organization that are brought about by progress. As a result of the rapid growth around Napier in recent years the Board found it necessary to establish a line depot in Onekawa. To further cope with this fast moving expansion, a new office block is now being built in Marewa, a Napier suburb. A summary of this report reveals some very important factors. A total of 6,600 kVA. Was being handled by five bulk supply feeders, each rated at 1,000 kVA. With an estimated demand of 10,500 kVA. In five years, it was obvious that the capacity of the system must be increased immediately. Whereas 1,000 kVA. was the standard adopted for the original bulk supply feeders, it was now proposed that this should be increased to 2,000 kVA. The already overloaded feeders supplying HAstings were to be relieved by the addition of an underground cable feeder rated at 2,000 kVA. Additional capacity was to be further obtained by increased conductor sizes on existing feeder lines. It was estimated that with this work completed, supply to the Hastings area would be increased up to 7,000 kVA. The Hastings Borough was still in the throes of a change-over from D.C. to A.D. as well as now having supply at both 11kV. and e.e kV. 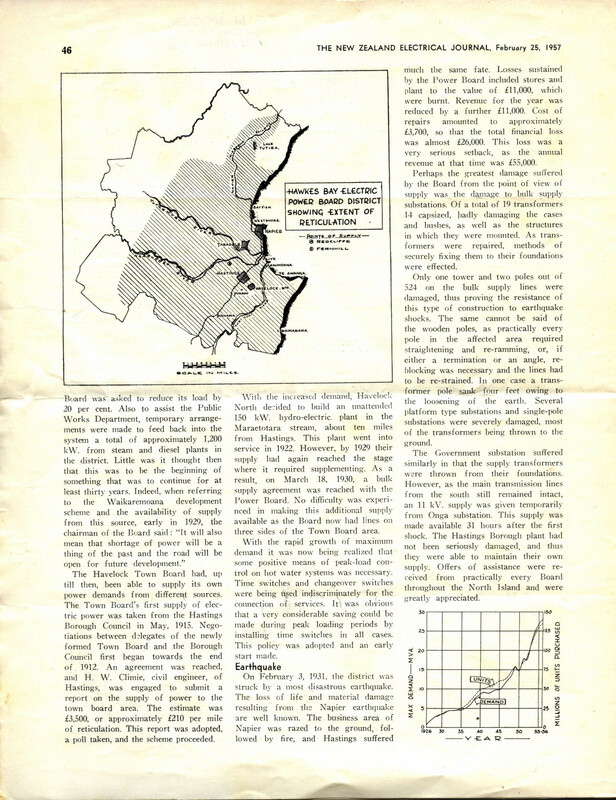 The existing system had many disadvantages—supply in the central portion of the town was poor; certain areas in the Borough were fed from an external system designed primarily to supply the rural area outside the Borough. The result was a general decentralization of control, and the difficulty of operating and maintaining supply. The proposals to overcome this problem were to be carried out in two stages. First was the re-arrangement of much of the existing 3.3 kV. equipment in preparation for the second stage of operations which was to be the complete change-over of the Borough from 3.3 kV. to 11 kV. At a special meeting of the Board in September, 1938, it was resolved that this report be adopted and that the necessary material be ordered and the work proceeded with. Immediately following the declaration of war in 1939 a curtailment of construction was brought about by the suspension of rural reticulation and the necessity to reserve materials as directed by the Electricity Controller. The direct result of this sudden halting of some of the major works was a necessity to reduce staff. Those who were “put off” were offered employment by the Government on line construction work concerning the reticulation of new military camps. Import restrictions had been making themselves felt for some considerable time, particularly with electric ranges. Kiosk type substation, 500 kVA. No great hardships, however, had been suffered in connection with the supply of materials for maintenance. The 150 kW. hydro-electric plant purchased as part of the Havelock North Town Board undertaking, had been running continuously in parallel with the Government system. The average weekly kilowatt-hours generated totalled about 9,000. In November, 1941, an investigation into the sudden shutting down of the plant revealed extensive damage to both the turbine and alternator which it was considered it was uneconomical to repair. The machinery and transmission lin were eventually dismantled. The conductor was No. 4 solid copper, much of which was used again as low tension, some of which still remains in service. The Board was very fortunate in that the programme for extra feeder lines, as set out in the 1938 report, had been almost completed at the outbreak of war, since, after two years of war, materials required from overseas were practically unobtainable. Capital works were confined to reconstruction of existing lines, new 11 kV. extensions had ceased, and it was not until early in 1945 that the Board was able to resume its policy of extending into the country. 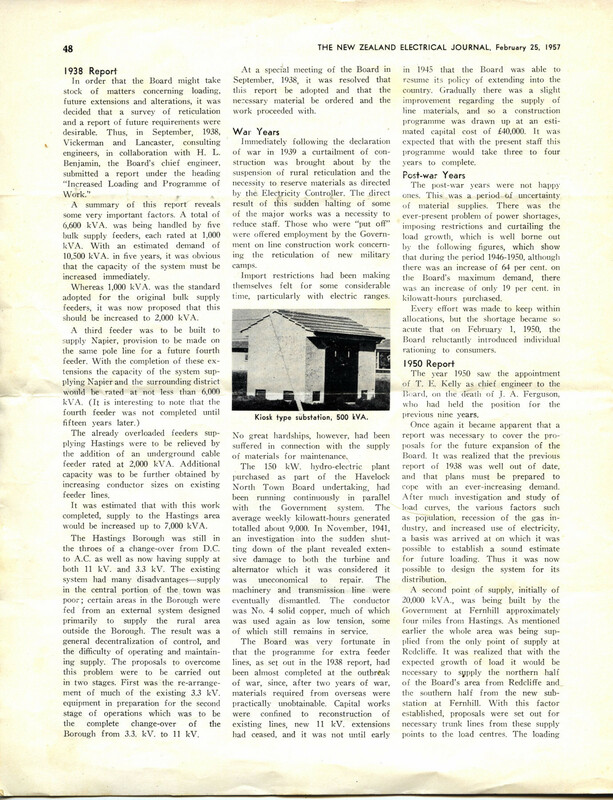 Gradually there was a slight improvement regarding the supply of line materials, and so a construction programme was drawn up at an estimated capital cost of £40,000. It was expected that with the present staff his programme would take three to four years to complete. The post-war years were not happy ones. This was a period of uncertainty of material supplies. There was the ever-present problem of power shortages, imposing restrictions and curtailing the load growth, which is well borne out by the following figures, which show that during the period 1946-1950, although there was an increase of 64 per cent. on the Board’s maximum demand, there was an increase of only 19 per cent. in kilowatt-hours purchased. Every effort was made to keep within allocations, but the shortage became so acute that on February 1, 1950, the Board reluctantly introduced individual rationing to consumers. The year 1950 saw the appointment of T. E. Kelly as chief engineer to the Board, on the death of J.A. Ferguson, who had held the position for the previous nine years. One again it became apparent that a report was necessary to cover the proposals for the future expansion of the Board. 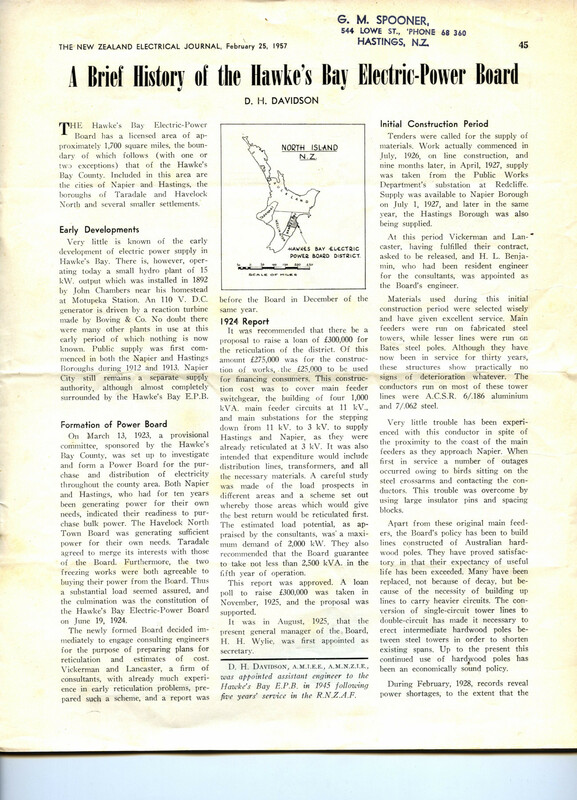 TI was realized that the previous report of 1938 was well out of date, and that plans must be prepared to cope with an ever-increasing demand. After much investigation and study of load curves, the various factors such as population, recession of the gas industry, and increased use of electricity, a basis was arrived at on which it was possible to establish a sound estimate for future loading. Thus it was now possible to design the system for its distribution. in the northern area was 6,000 kVA., whereas the feeder capacity was 4,000 kVA. 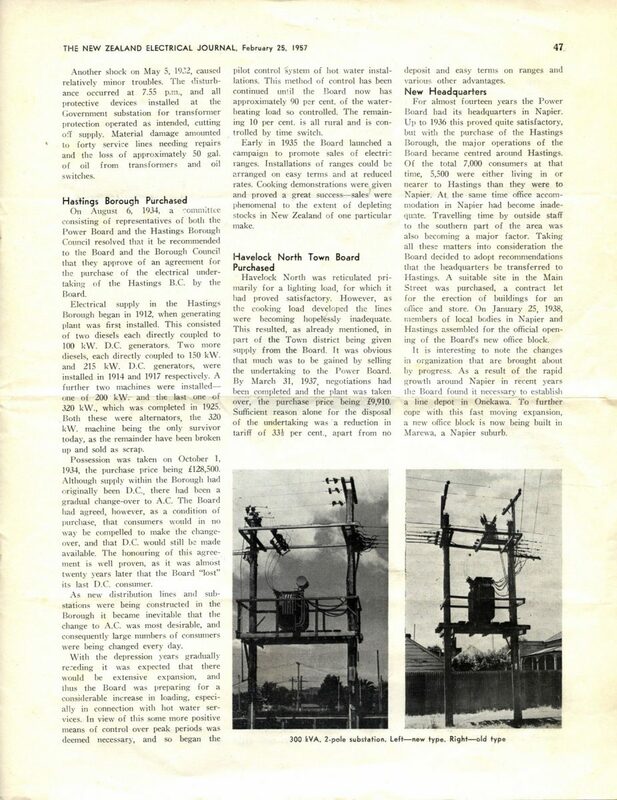 The first move to increase capacity was the completing of the fourth Napier feeder of 2,000 kVA., for which provision had already been made on the third feeder built in 1939/1940. A further proposal to replace the two original 1,000 kVA. aluminium conductor feeders with copper conductors (2,000 kVA.) was rejected in favour of 11 kV./22 kV. auto-transformers installed at either end of the existing feeder lines. It was considered that the completion of this programme would suffice until 1956. To date there still remains one of the aluminium feeders to change to 22 kV. As it is now six years since the report it was prepared it is only natural that it may be necessary to make alterations to the programme to cope with changing conditions over this period. One such deviation from the original plan is now a proposal to increased these two main feeders to 33 kV. The southern area, which includes Hastings, was to be supplied from the new Fernhill substation. The proposal was to build immediately two circuits with provision for two more on the same pole line. These feeders were to be of 3,000 kVA. capacity each. An existing feeder was to be rebuilt as a double circuit and two further circuits to be built after 1957. The two circuits originally planned have been completed, and a third circuit has also been run on the same pole line, there still being provision for one more feeder. Again there will be further deviations from the original programme owing to the advent of 33 kV. transmission. Included in this report are proposals to build four switching substations at load centres—these substations to be tapped off trunk lines. The main advantage of the substations is that faults in the local area, which they supply, will not affect the main feeders and will minimize interference. For the last two years the Board has had a third point of supply. This source is from the recently built fertilizer works at Awatoto, approximately four miles south of Napier on the main highway. Surplus heat, generated during the burning of sulphur for the manufacture of acid, is used for steam raising and subsequently the operation of a turbo-alternator. The capacity is 750 kVA. at 0.8 power factor. When the acid plant, which is at present almost completely duplicated, is in full production, the expected feed-back into the system will reach a maximum of 800 kVA. during certain periods. A bank of two 500 kVA. transformers is installed at the works. These transformers also supply a shingle-crushing plant nearby. Over recent years several substations of this kiosk type have been built. These have been confined to residential areas where the low tension reticulation has been mainly at the rear of sections. Rural reticulation has always been foremost in the Board’s policy. At present the rural lines are extending beyond the Lake Tutira area to a point on the Napier-Wairoa highway about 40 miles north of Napier. Most of these lines are being run with A.C.S.R. conductor, some of which is of the smooth-body segmented type. Some small spur lines are run with galvanized steel and are single phase. Transformers used are mainly 7.5 kVA. and 10 kVA., 11,000/480/240 V.
The following names are those of past chairmen of the Board, the dates indicating the period during which they held office. T. E. Cross (1924; 1932-1937). M. S. Chambers (1941-1943; 1951-1953).